Inspired by the downhome luthiers at Cigar Box Nation, the instructional videos of Keni Lee Burgess on YouTube, and Steve Lodefink's cigar box guitar, I've started making my own cigar box guitar. For the neck, I am using a piece of the same kitchen table that I used to make the Clubhouse Strummer. I've already made enough mistakes (like installing the frets crooked and cutting the head too thin) that I've decided that this is going to be my practice guitar and I'm not going to worry screwing up. 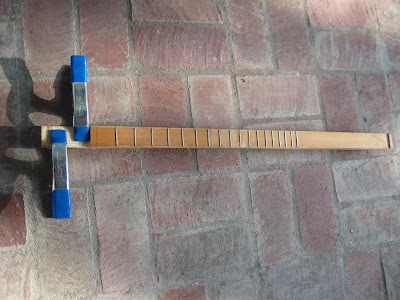 I'm just thinking of it as a way to learn how to make cigar box guitars. It's really liberating -- I'm going to try my best, but I won't be upset if I fail because I know I will get another chance.